Hydrogeology deals with the distribution and movement of groundwater in soil and rocks of the Earth’s crust, commonly defined aquifers. In the last few years, a progressive depletion of water resources has taken place in the mountains due to the increase of an anthropogenic activity and change in precipitation regime. These aquifers have a high vulnerability through their limited productivity and their short and swift flow paths. The complex and important role of the correct management of mountain water resources for their better exploitation is the start point of our research. In order to characterize mountainous aquifers our multidisciplinary approach is based on geological, geochemical, hydrological, hydrogeological, geostructural and geophysical methods. Sometimes biological, microbiological and toxicological experts are involved in our research for a more in depth understanding of aquifers composition. Once data are collected, they are processed with statistical analyses (i.e. Principal Component Analysis, Cluster Analysis, etc.) and hydrogeological modelling. 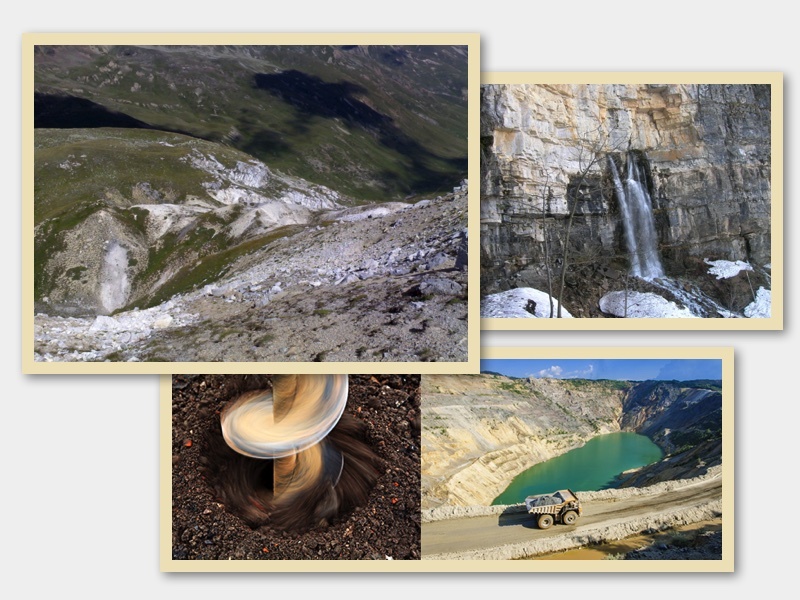 On the left-top: Sinkhole-Dolina in Alta Val Federia (Livigno, Italian Alps). On the right-top: Karst spring in Cuneo (Piemonte, Italy). On the bottom: Example of groundwater extraction.